Reindeer or karibou are the only antler-bearers where the female also is wearing an antler. One of the hypothesis for this fact is that the reindeer need an extra cooling device during summer, when they are fattening and the fur is growing thick. 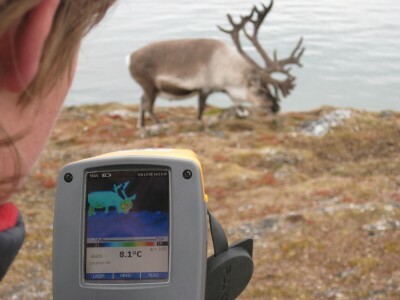 Reindeer are so well adapted to the cold environment that loosing heat has become a problem. As long as the antler is covered with skin, the reindeer can regulate the amount of blood around the antler and regulate heat loss. I want to do some research on this. 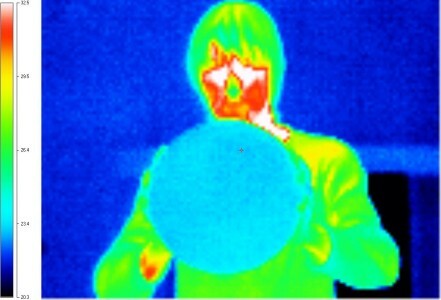 Kings Bay owns an expensive thermal imager which I can borrow from Erlend M�re. Janwillem and I go testing. We try to make a picture from a resting reindeer and a running reindeer. That was quite a challenge. But on the pictures you can see beautifully that the antler is a warm spot and that more of the antler becomes warm during running. This is what I hoped. And I am trying to develop a new research project. 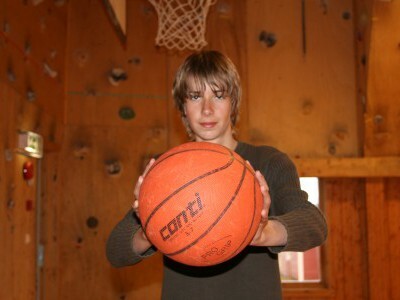 We practiced with the camera by taking pictures of Janwillem during a basketball play. 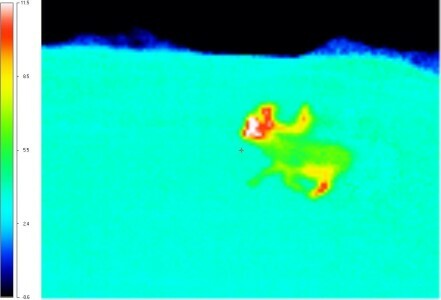 You can see his warm face and the arm in the sleeve. This page has been given the following keywords: [reindeer] [science] You can click on each keyword to get an overview about related pages.